2015 Blogger Challenge and Giveaway! Welcome to the first stop on Shabby Fabrics 2015 Blogger Challenge! Shabby fabrics has a released a new line of pre-fused laser-cut appliqué shapes called Shabby Shapes! These fun designs are perfect for crafters and quilters of any skill level. To use them all you need to do is peel off the backing, iron them on, and add your finishing stitch of choice…. and that’s it….So easy and the possibilities are endless!!! Here are just a few of their super fun options….. They have so many fun designs and size options in solids, pin dots, and prints….and don’t forget letters!!! Check out all of the Shabby Shape options HERE. Sooooooo……. Shabby Fabrics has asked a few bloggers to come up with some fun projects using these awesome Shabby Shapes. You want to see what I made??? This “Not So Shabby Hearts” quilt finishes at 30″ x 38.5″ and is an easy baby quilt project. I used these super cute X-Large 5″ pin dot hearts! Here is how you can whip up this super cute baby quilt in one day alone…. (12) 10″ squares of your background fabric….I used a white layer cake. (2) packages of the X-Large 5″ pindot hearts. They come 12 in a package. (4) 2.5″ x WOF strips for your binding….I used 4 Jelly Roll strips. 1.5 yds for backing fabric. Peel your heart away from the backing film. Gently so you don’t fray the edges. Line your hearts up, 2 to a square about 1″ from the edges on the right and top/bottom sides. Then press with a dry iron for 5-7 sec to fuse the hearts to your background fabric. To keep the line up the same for each block, I stacked mine on top of each other so I could see the hearts on the previous square to help me line it up quick and easy! Once you are done with all your squares, you need to top-stitch down your hearts(if you don’t they will eventually fall off). I used a simple straight stitch about 1/8″ around the edges, but you can use a blanket stitch or a zig-zag if you like. Next, sew all your squares together in a 3 across x 4 down lineup. Bam! Your top is done. I used an all over stipple for my free motion quilting design. My backing was a simple gray pin dot. Using 4 white jelly roll strips I made my binding and applied it using THIS TUTORIAL. Be sure to check out all the other stops on Shabby Fabrics 2015 Blogger Challenge! Erin at Why Not Sew? Want to win your very own set of these 5″ hearts??? Check out all of Shabby Fabrics new fun pre-cut and laser fused shapes HERE. Then come back and let me know by leaving a comment on this post! Contest ends Sunday, Mar. 22, midnight/EST. Open internationally. (Update)And the Winner is….. Chris! A Mini Charm Pack of Fresh Cut by Basic Grey for Moda Fabrics and…. a 9 FQ set of Fresh Cut by BasicGrey for Moda Fabric! Shabby Fabrics has lots of great fabrics, pre-cuts, BOM programs, quilt kits and patterns. Here are some of their new collections I am in love with! Daysail by Bonnie & Camille for Moda Fabrics. They have these cute FQ sets in red, aqua, navy and green! Pre-cuts and yardage are also available HERE. Another fun new line is Rhapsody Bop by Adornit Fabrics…. A Shabby Fabrics Exclusive that is being offered right now is the Kimberbell Pillow Club Bench Pillows as individual kits. Previously these were only available as part of a 12 month program but they can now be purchased individually! Lots of fun pillows to choose from and these Pre-fused/Laser-cut kits make them a snap to put together. Look through the kits HERE. Contest ends Thursday, Mar. 5th, midnight/EST. Open internationally. Yep! A $30 gift certificate to spend at their online shop. Shabby Fabrics has lots of great fabrics, pre-cuts, BOM programs, quilt kits and patterns. Here are two of their new fabric collections that are my favorites right now! And have you seen their laser cut and pre-fused applique kits? Soooo easy! Check out this one perfect for Valentines Day! Shabby Fabrics has a special deal for you this weekend too…. They have a special coupon code for 12% off STORE WIDE and their hundreds of remnants will be on sale for 20% off! These two offers can be combined for extra savings and are for this weekend only! The sale ends at midnight on Sunday night so hurry while supplies last! Contest ends Thursday, Feb. 5th, midnight/EST. Open internationally. Winner announced the following Friday. Christmas Keepsakes and a Giveaway! Today is my stop on the Shabby Fabrics Christmas Keepsakes Blog Tour! Shabby Fabrics is excited to announce their newest BOM quilt…..Christmas Keepsakes! Doesn’t this quilt just make you feel all warm and fuzzy??? Christmas Keepsakes is a 10 month Block of the Month quilt that is designed with 9 applique blocks and has just the perfect borders to make this quilt extra special! It finishes at 36″ x 36″ and is offered in traditional or laser-cut/pre-fused applique style kits with border, backing, binding and embellishments included. Shabby Fabrics has asked me and some other lovely ladies to each try one of these pre-fused and laser-cut applique blocks and tell you what we think……. So hears the deal, I have never tried a pre-fused/laser-cut applique project, but let me tell you…..I am completely won over!!! Yep! All my pieces….ready to roll. All I had to do was peel off the paper backing, put everything in place and give it a press!!! Stitch everything down however you like and…….. Seriously…..I spent more time tying that bow than on the entire block:) I think I might just have to make this entire quilt! Christmas Keepsakes is a 10 month program that starts January 2015 and runs through October 2015 and is only available at Shabby Fabrics. This one is so easy you will definitely have it finished and ready by Christmas! 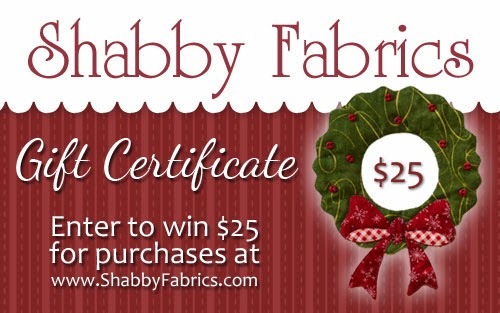 Shabby Fabrics is giving away a $25 gift certificate for their shop at each of the stops on the Blog Tour…..that’s a total of $200 up for grabs! So be sure and check out all the stops this week. Leave a comment on this post telling me which you would pick…..
Erin @ Why Not Sew? Sign up for Shabby Fabrics Newsletter HERE! Shabby Fabrics and a Giveaway! Sassy Saturday is brought to you this week by Shabby Fabrics, a new sponsor here at The Sassy Quilter! Here are a few that really suit my fancy! Shabby Fabrics offers lots of fun Block of the Month programs, Quilt Books, Quilt Kits and specializes in Laser Cut/Pre-fused Applique Kits. You can find their YouTube channel HERE with lots of videos on things like color sense, piecing techniques, applique, and hand embroidery. They offer affordable shipping at $6.00 for US orders under $75 and free shipping for US orders over $75, plus International customers get 20% off published shipping rates. As part of their Loyalty Program you also earn 5% back for every dollar you spend for your future purchases! What do they have for you today??? A charm pack AND 7 Fat Quarter bundle of April Rosenthal’s new line, Best. Day. Ever! ……winning this really will be the Best. Day. Ever! Contest ends Thursday, Sept. 18th, midnight/EST. Open internationally. Winner announced the following Friday. Shabby Fabrics is offering a 10% off coupon code, SASSYQUILTER10. Good for one use and expires 10/21/14.